After a tussle with some kidnappers, Alice hooks up with a convoy of desert rats -- including franchise regular Carlos (The Mummy's Oded Fehr; cursed to face-off supernatural bad-guys forever? ), Claire Redfield (Heroes' hottie Ali Larter), obligatory teen K-Mart (Spencer Locke), personality vacuum Nurse Betty (R n' B star Ashanti), etc. Elsewhere, corporate villain Dr. Sam Isaacs (Iain Glen) is experimenting on clones of Alice in his Umbrella Corp. facility beneath the desert -- swarmed by thousands of zombies above and only accessibly by helicopter. There's always a jarring sensation between these movies, as neither has led naturally to the next. I'm assuming they make more sense if watched in immediate sequence (anyone for a RE marathon? ), but a recap of events isn't forthcoming and I spent a good 10 minutes trying to remember if the climax to Racoon City-set Apocalypse necessitated this jump into Mad Max territory. I suspect writer Anderson (despite being heroine Jovovich's fiancé) just couldn't be bothered crafting a franchise that makes chronological sense, and instead inserts offers an early narrated sequence that leap-frogs us into a post-apocalyptic scenario. Director Russell Mulcahy -- career highlight Highlander ('86), career lowlight Highlander II ('91) -- actually deserves credit for making Extinction anywhere near watchable. He can't improve the pedestrian plot or bland characters, but he orchestrates some diverting action sequences, and the production values eclipse the previous films. So yes, it's visually more appealing and has enough schlocky moments to satisfy gorehounds. Alice's escape from zombie dogs, an attack by a murder of crows, a 360-degree fiery camera-rotation, and the climactic assault on Dr. Isaac's compound, are all eye-catching stuff -- even if you don't care about anybody in jeopardy, or the outcome. And the less said about the boring mano-et-monster grapple (a staple of every instalment), the better. Chances are you've seen the previous flicks, so already know if you're willing to give this a chance. It's the kind of film where they say "lock and load" with a straight-face, and features the cliché of someone being bitten by a zombie and keeping it a secret. Never a good idea. It's loud, brash, dumb and wholly reliant on jump-scares. The zombies aren't frightening, and the only interest comes from watching Jovovich hack-n'-slash throats with two massive knives, as Iain Glen chews up the screen from his subterranean lair. It looks quite stylish (a sequence in a sand-covered Vegas is stand-out) and doesn't overstay its welcome at a sprightly 94-minutes, but it still doesn't compete with the games' ability to chill blood. Maybe that's why the Japanese have made their own CGI animation, Resident Evil: Degradation, having spent the past 5 years watching Hollywood stink-up their pixels in live-action. 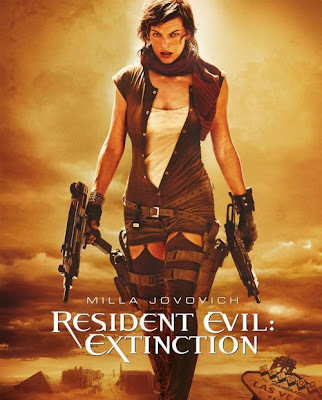 Needless to say, Extinction sets up a fourth instalment that will be twice as ridiculous, but I'm sure Milla Jovovich will be back to pout, chew some English, show her thighs, and high-kick zombie scum. As for Mulcahy, he's been rewarded for this surface-level success with direct-to-video prequel The Scorpion King 2: Rise Of A Warrior. One step forward, two steps back -- huh, Russ.